Green Thoughts: What’s in a name? Most tongue-twisting Latin names of plants are associated with so-called “discoveries” by Western botanist or explorers: the Bougainvillea is named after Monsieur Bougainville; the golden trumpet or Allamanda after Switzerland’s Frederich Allamanda. Swedish botanist, physician and zoologist Carl Linnaeus. 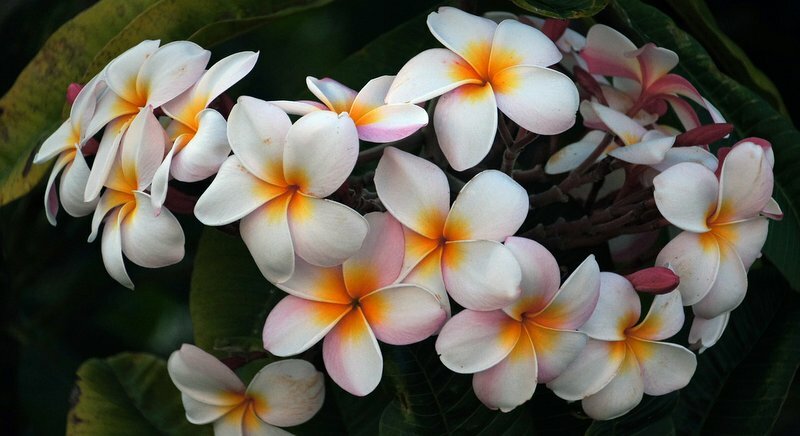 So too this week’s subject : the Frangipani – renamed the Plumeria after Charles Plumier, another intrepid Frenchman. 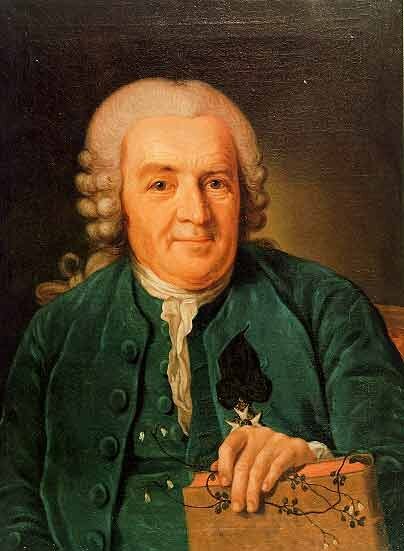 The original classifier of plants, Sweden’s Carl Linnaeus, based his Systema Naturae on shared physical characteristics. Not always reliable, most of his groupings have nonetheless stood the test of time. But to this day, Western botanists love rechristening plants and altering the orders, families or genera to which they belong. Not so plant names in Phuket’s plant nurseries. With few exceptions, these carry the same oral monikers used by generations of Thais, names which in many cases have still not appeared in gardening books. 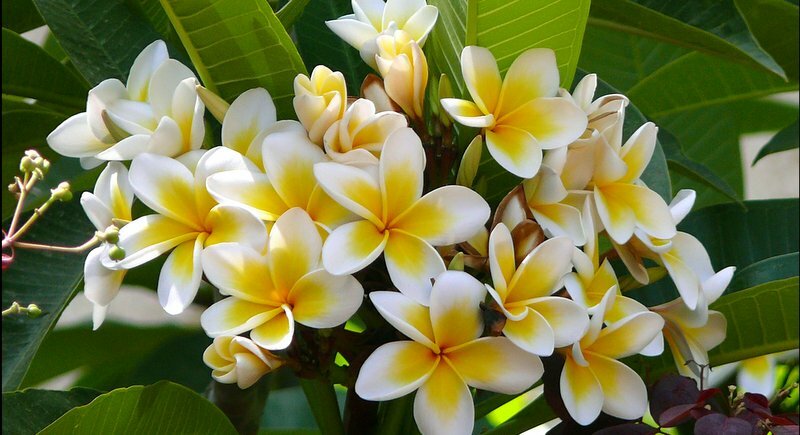 One exception is the Plumeria, which has changed not only its botanical name but also its Thai one – from lantom to leelawadee. Why? Because lantom is a sad word, associated in the superstitious Thai imagination with Buddhist cremation grounds and Muslim cemeteries. In contrast, leelawadee is appropriately graceful and upbeat. Of course the Plumeria is always one of the first name on anyone’s list of desirable garden plants. Its glory? The waxy, five-petalled flowers that burst forth from slender branch ends. Arranged in an attractive propeller-shaped form, they carry the most intense fragrance, especially at dusk, when the blooms attract the sphinx moths that seek to pollinate them. Traditionally used in Hawaiian garlands, floating individual blooms are used in Phuket’s spas to scent and decorate water-filled bowls and containers. Related to the Nerium oleander, it shares with its cousin the same poisonous, milky sap which oozes immediately from any cut or broken branch. There the resemblance ends, for the Plumeria’s young growth is round, green and soft (hence the Australian name of dead man’s finger), only later turning to familiar woody grey branches. The shrub – more properly a small tree – has a very open, rounded crown and the clusters of flowers generally appear before the new crop of foliage. 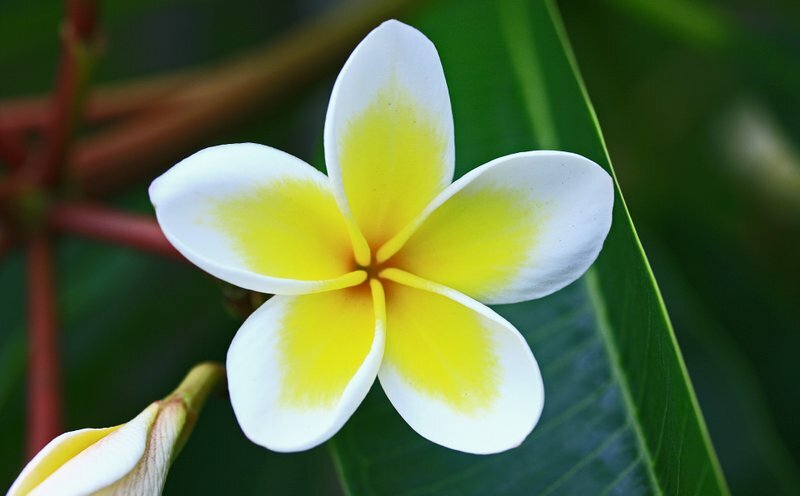 As a result, the Plumeria is a good choice for the mixed border or as an ornamental lawn specimen; it does not become dense and bushy and so will not deprive low-growing neighbours of sunshine and space. Plenty of light and air will filter through to smaller shrubs and annuals. And the root system is compact. So it will tolerate a large container, though personally I prefer to give the Plumeria the freedom of an open situation where it can attain a height of about twenty feet. Plumerias are one of the easiest shrubs to grow here. For a start they are not fussy about soil, and prefer full sun. And because Phuket gets so much sunshine, they will do well in filtered shade. The one thing they dislike, in common with most members of the apocynaceae clan, is wet, cold soil or deep shade. In drought conditions, they will discard leaves but survive without a fuss. A true tropical. Though there are at least four distinct species, most popular cultivars derive from either Plumeria rubra or obtusa. From the West Indies, obtusa has large leaves, with rounded or blunt tips. Typically the sweet scented flowers are creamy white with a yellow centre. Dwarf Singapore Pink is a popular hybrid on account of its relatively compact habit and profuse flowering patterns. Singapore White is a vigorous white-flowering cultivar. 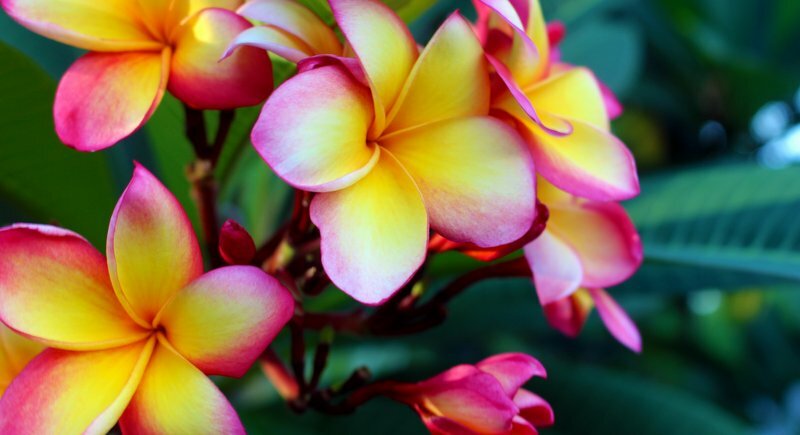 Most varieties derive from Plumeria rubra, originally from Central America. Larger than those of obtusa, the leaves, shiny with pointed tips, are often over a foot long. Many cultivars are grown in the tropics, especially in Hawaii and Phuket, but there is little consistency about names. What’s new! However, the range of colours is extensive, with hues ranging from snowy “Bridal White” through yellow “Celandine”, to the rich crimson hues of “Dark Red”. There is even a spectacular variety called “‘Rainbow” which had deep pink buds, and peach coloured petals which shade to yellow at the centre. With hybridization has come larger clusters of blooms and lusher foliage as well as a greater range of sizes. Dwarf forms are particularly suitable for the smaller garden or terrace. The Plumeria deserves its place near the top of the pile – for both its visual and olfactory appeal. It will take readily from cuttings (which should be placed in barely moist soil) and, once started, will prove a low-maintenance addition to your garden. The only real drawback is that it has a period of dormancy when the leaves tend to discolour and fall. And it is susceptible to a disease called rust which attacks the underside of leaves and creates powdery brownish lesions, makes the foliage look unattractive. But it’s a small price to pay for a top shrub. Patrick has been writing for ten years about gardening in Phuket and allied topics. If you have horticultural or environmental concerns, please contact him at drpaccampbelll@gmail.com. Many of his earlier creative and academic publications can be found at Wordpress: Green Galoshes.